Home Costs > How Much Does Tuckpointing Cost? Tuckpointing, also commonly referred to as repointing, is the process of improving the existing masonry joints in a masonry wall. Even if your mortar and the joints are in great condition, some homeowners often want to improve the look of their brick. During the process, fresh mortar is tucked into the joints to replace the older, crumbling mortar or to even decorate a wall for aesthetic purposes. On average, as an estimate, plan on spending about $5 to $15 per square foot, with most professional requiring at least $200 to $300, at a minimum, before they accept the job. Even though the materials are cheap, it’s the labor and set up that takes up most of the job. Most contractors, however, may lower the price per square foot if the job is larger than their standard rate. The costs will depend on your geographical location, the contractor you hire, the complexity of the job and the size of the job. A good-sized chimney, which is about 150 square feet, on average, can cost about $750 to $1,500. Since most jobs can be unique, consider getting an exact quote from local contractors, for free, at HomeAdvisor.com. This free tool allows you to explain your job and licensed contractors in your area will contact you will estimates. What kind of experience does the contractor have? An inexperienced handyman will be much less than a masonry who has been in business for 20 years with great references. Also, what kind of work have they done in the past? Are they insured? Are they recognized by the BBB? If so, what are their reviews and what kind ratings do they have online? How long will the job take? If the job is relatively straightforward and easy to access, then it may only take a contractor a few hours to complete the job, whereas a complex project, in a hard to reach area or harder-than-average mortar removal could increase the time needed to complete the job. Since almost all contractors base their quotes on the time invested, the more time invested, the higher your bill will be. The cost of materials they use, while a fraction of the total, will still affect the cost. This can include the mortar being used, the colors, if you want it waterproofed and/or the tools needed to complete the job. If your bricks are cracked or have even fallen apart, then this can increase the costs as these bricks will have to be replaced. During the repair, a contractor will first remove the older mortar, if necessary, by grinding to a desired depth, which is usually about a half of an inch deep. After the older mortar is grinded out, the new mortar will be “tucked” in between the joints using a tool known as a pointing trowel and will match the home’s color and composition. A good contractor can tuck point about five square feet per hour. Decorations, while optional, can increase the costs by more than 30 percent or about an additional $5 per square foot extra. Lime-based mortar, for example, can be used to frame red bricks with white lines. Adding caulk inside the joints next to the windows, again, while used for decorative purposes, is often done to create a cosmetic value. This can cost an additional $50 or so. Replacing broken bricks can add another $5 to $10 per square feet. Wall cracks, depending on the severity, can cost about the same as replacing the bricks. This will all depend on if the cracks can simply be removed or if the whole wall needs to be replaced. Waterproofing the mortar, after the tuckpointing job is done, can add another $1 per square foot. This process prevents water from entering the wall cavity. A new chimney cap, if necessary, can cost an additional $300 to $550, depending on the location or the size. Newer mortar can be destroyed by a deep freeze, so it’s best to consider hiring a professional during the late spring or early months. Whenever the brick has lost about one-fourth of an inch of its depth, then it’s time to consider tuck pointing. As a general rule, the mortar will last about 25 years. 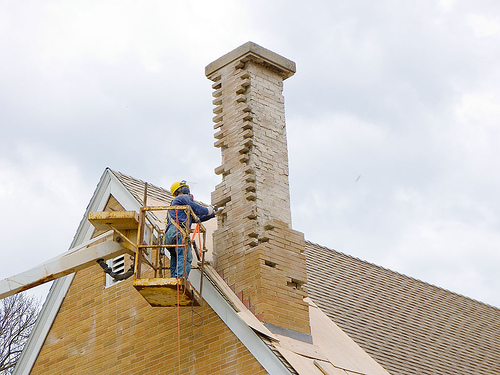 The benefits of tuckpointing, as explained by MyChimney.com, includes stopping the corrosion, restoring the structural stability, preventing water from entering the chimney and the value of your home is restored due to the masonry being in top condition. Always try to get as many quotes as you can before deciding on a contractor. Aside from the price, be sure to pay close attention to their past work, their online reviews, insurance and experience.